“Most people call me Coco because my little brother couldn’t say Nichole,” says the sylphlike Irwin rebel with a sweet smile that belies her off-the-grid toughness. “I’m whimsical with hints of metal and tattoo, and sort of dark and twisty, but not in an evil way,” she laughs. Nichole Reycraft was born in Gunnison and her parents, Russ Reycraft and Renee Wright, raised her up as a free-spirited Crested Butte kid from the late 1980s. Her family eventually grew into a clan of six siblings with a mom who was a jack-of-all-trades, including an aerobics teacher and cake-maker, and her dad is still on the Crested Butte Mountain Resort ski patrol. She was seven when her parents divorced and afterwards, Nichole inherited Mike Wright as another father figure. Nichole’s childhood was mostly spent in a house on Butte Avenue looking up the valley at Gothic Mountain and Paradise Divide and she grew up playing all over the spring drainages when the snow melted. “Back in the day, there used to be a huge puddle right in front of our house where all the neighborhood kids would swim. It was deep, it was huge, but then, we were little,” she says, and recalls the historically notorious town potholes when the streets were dirt and there was an unblocked view through all the horse pastures spread up the valley. “None of those houses on the other side of the street were there. We’d spend a lot of time naked in the snow because we were Crested Butte kids.” In the summer, there were mud pies to be made and hunting for fossils around Peanut Lake. “You’d spend hours out there playing on the old coal heaps out by the Gronk and we had a whole network of forts in all those willows. I wore prairie dresses and bonnets with my baby Jesus strapped on my back until I was 14. I was all about the Oregon Trail and caribou hunting and playing out my fantasy of ‘Julie of Wolves,’” she grins about her wilderness make-believe world on the edge of a real-life wilderness at the end of the road. 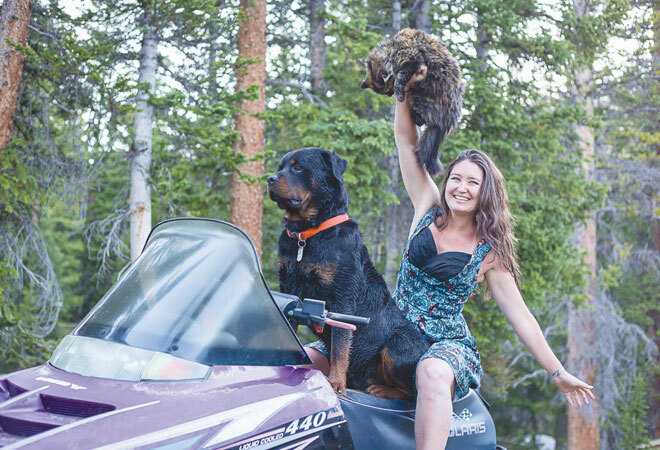 After Nichole graduated from the Crested Butte Community School (CBCS) in 2006, she was thinking she wanted to continue to pursue her theater arts as well as travel the world. She started off by signing up for a mission to backpack medical supplies, food, and water to different South African villages, in Zambia and Zimbabwe. “I loved Africa. I was based out of Livingston and I worked really hard, but we never got to do the things we signed up to do,” because, she explains, that was when the Overland Missions group arrived. The base hadn’t even been built yet, “So we wound up building the base. When we got there, it was only tents and one thatched-roof shack with straw and dirt on the floor. I ended up doing a lot of babysitting for the leaders’ kids and actually doing the construction building. It wasn’t my scene and I didn’t want to do bible study. It wasn’t supposed to be evangelistic and it turned out that it was.” So Nichole understandably bolted a month and a half early. When she returned from Africa, Nichole headed off to college at UNC Greeley, and she grimaces, “I hated every minute because the place smelled like cow sh*t and frankly, I wasn’t interested in learning. I wasn’t interested in being there at all, even though they have one of the best theatre programs in Colorado.” She returned home to Crested Butte after her first semester. She signed up at Western State College (WSC) and laughs, “I spent nine years there because I would take a semester off to work and then go back.” Although she mostly paid her way through school as she went, she smirks that she still has plenty of student loans to pay off. The entire time she was at Western, Nichole was involved in theater, but she still didn’t know what she wanted to do in the big picture of life. “There are so many things I have an interest in and I’m good at a lot of different things, but I’m not career-driven. I’m into my writing and theater, and I love working with people and that means I can do a lot of different things and be happy,” she wisely surmised. Being an actor and trying to survive and pay the rent in this town translates into being adaptable with many talents. Throughout her life in Crested Butte, from the age of 14 when she took her first job at Ruby Mountain Bakery, Nichole worked on and off for 10 years at Stepping Stones Preschool, with stints at the Sunshine Deli (the Sunflower), Camp 4 Coffee, Mochas, Le Bosquet, as Crested Butte Community School’s front desk receptionist, and manager at Townie Books, to name a few of her juggling acts. Nichole is now living her childhood wilderness fantasy as a full-time Irwin resident, through her “manpanion,” as she calls her significant other, Tom Kelly, who owns a remote cabin in the winter-isolated former silver mining town ten miles up the winding Kebler Pass road. Tom owns Unearth Construction but in the winter he works for Eleven, with their exclusive cat skiing resort in the extremes of Scarp Ridge and Ruby Mountain in Irwin. “Before we started dating, I had only been on a snowmobile three times in my entire life and I crashed and destroyed every single one. By the time I moved to Irwin, I had my own sled and had learned how to use it. I’m pretty sure I was the goofball up there,” she laughs about her entry into remote living four years ago. “I moved in the very frickin’ heart of winter into a cabin the size of a breadbox, but we all fit—me, Tom, Onyx our Rottweiler and our kitty Princess Aslog of Kattegat. I love everything about being up there. We’re not in the townsite, we’re closer to the base of Ruby, completely hidden in the trees. It’s a challenge getting back and forth to work, but I’ve never once been late for work because of living in Irwin. I feel like it’s the last rebel outpost. The crew of us out there are such a tight-knit community because we have to help each other survive. The people who are out there are strong and really uniquely beautiful characters,” says the theater-bookie nerd who likes to sing karaoke and who spent this epically snowy winter alone while Tom was working in Iceland and Japan. “I learned something new about myself, learning how to live up there and challenging myself every day,” she said. “I love the lifestyle, that off-the-grid, quiet, independence and with the elements. I never want to live any other way again now. I wake up every morning feeling like the luckiest girl in the entire world, with amazing friends and being surrounded by that kind of beauty really inspires the soul. It feels really old up there, almost ancient, rustic, of days long ago. “My family is everything to me and they’re the reason I want to stay close by. My mom is my best friend,” Nichole says, and her mom is also her musical partner. Renee and Nichole play Americana folk music on guitar and their sweet voices blending in perfect harmony as only mother/daughter vocals can. (You can catch them at the Princess Wine bar every other Thursday). Nichole laughs that she had no idea she could sing until she braved the stage at karaoke one night. “Turns out I had a decent voice, so I kept going. Mom started playing guitar about 13 years ago. I came in once while she was practicing and started harmonizing and it sounded pretty okay—actually more than okay,” Nichole says confidently. They call themselves Nuthatch Harmonies since both she and her mom are obsessed with birds. “Mom’s an avid birder. I just love to sing, it’s what I really enjoy and mom loves to play so we look forward to our gigs and hopefully more in the future. I love people and between the writing and the music I have my creative outlet and that’s so important,” she feels.